In 2016, roughly 12,000 Qualfon employees volunteered 39,011 hours of service to support 162 charitable organizations and non-profit agencies. The community service contributions benefited schools, churches, children’s homes, animal shelters, government entities, and other humanitarian associations across four countries. Community service is synonymous with Qualfon’s company mission to be the best BPO and make people’s lives better, and these 39,000 hours of effort demonstrate just how much our employees believe and trust in our mission. 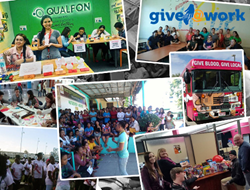 Qualfon, a mission-driven business process outsourcing (BPO) company and global provider of contact center services, announced today that in 2016 roughly 12,000 employees volunteered 39,011 hours of service to support 162 charitable organizations and non-profit agencies. The community service contributions benefited schools, churches, children’s homes, animal shelters, government entities, and other humanitarian associations across four countries including the United States, Mexico, Guyana, and the Philippines. “Community service is synonymous with Qualfon’s company mission to be the best BPO and make people’s lives better, and these 39,000 hours of effort demonstrate just how much our employees believe and trust in our mission,” said Dolores Torres, Give@Work & Mission Office Director, Qualfon. Working together to maximize their impact, employees from every contact center around the world offered their time and talents to make communities more inclusive, economically empowered, and environmentally sustainable. Sponsoring a variety of events and partnerships, Qualfon’s Mission Office and Give@Work program supports and recognizes employees who volunteer their time. Examples of employee volunteerism include teaching others, visiting hospitals, building houses, adopting graduates and school children, lending a helping hand, cleaning, walking dogs, caring for children and the elderly, feeding the homeless, and donating food, clothes, blood, school supplies and health supplies. In 2016, Qualfon also partnered with the St. Brendan Catholic Church in Haiti to expand its reach to residents affected by Hurricane Matthew. All other efforts focused on local communities in the areas in which Qualfon operates. “People are the platform through which Qualfon’s customer service is delivered, and at the same time people are the key to making improvements in the world. This is why Qualfon puts the person first, investing in employees, families, and communities,” added Torres. As Qualfon celebrates the company’s 2016 humanitarian efforts, executives would like to pay a special tribute to Dolores “Lolo” Torres for her tireless contributions to the Mission Office and for continuously driving Qualfon’s Give@Work initiatives. After 20 years of making peoples’ lives better, Ms. Torres has announced her retirement from Qualfon. Her work will now take a different shape. She will spend the first year of her retirement volunteering for the city of Quatro Cienegas in support of its 2040 plan. With the help of the Qualfon Mission Office and Ms. Torres, this small town in Mexico is developing a transformational strategy aimed at increasing educational opportunities and lifting its residents out of poverty. Qualfon commends Ms. Torres’ personal commitment to continue enhancing the lives of others.